What do controversial On the Run letters actually say? 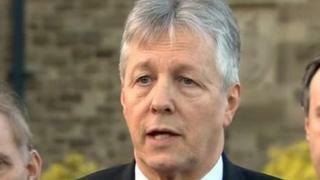 Image caption Peter Robinson called them 'get out of jail free cards' but what did On the Runs letters actually say? Peter Robinson has called them "get out of jail free cards". The first minister has said On the Runs have letters "stuffed in their pockets" guaranteeing that they will not be prosecuted for any offence. The DUP has claimed that amounts to a general amnesty for those concerned. But is that the case? What do the letters actually say? We do not know if all of the so-called "letters of assurance" were couched in identical terms, but evidence presented in private hearings at the Old Bailey suggests they were, and that legal safeguards were built in. In his judgement in the case of John Downey who denied the murder of four soldiers in an IRA attack in Hyde Park in 1982, Mr Justice Sweeney refers to the fact that on 15 June 2000, Jonathan Powell, who was prime minister Tony Blair's Chief of Staff, wrote to Sinn Féin president Gerry Adams enclosing letters representing decisions by the attorney general and the director of public prosecutions for England and Wales. The letters stated that: "Following a review of your case by the director of public prosecutions for England and Wales, he has concluded that on the evidence before him there is insufficient to afford a realistic prospect of convicting you for any such offence arising out of..."
Anyone already convicted of paramilitary crimes became eligible for early release under the terms of the Northern Ireland Good Friday agreement of 1998. Anyone suspected of, but not charged with, paramilitary offences committed before the Good Friday Agreement. Those who had been charged with offences but who had escaped. Those who had been convicted of offences but who escaped. They went on to say: "You would not therefore face prosecution for any such offence should you return to the United Kingdom. That decision is based on the evidence currently available. Should such fresh evidence arise - and any statement made by you implicating yourself in... may amount to such evidence - the matter may have to be reconsidered." There are a number of key phrases. The statement that the decision is based on "evidence currently available" clearly suggests that if new evidence was to come to light, the issue could be reconsidered. That is reinforced in the next sentence when it is spelt out clearly that should any fresh evidence arise "the matter may have to be reconsidered." The judge also noted that on 22 March 2002, a briefing note was prepared for the prime minister for a meeting with Gerry Adams. By that stage Sinn Féin had provided a total of 161 names of On the Runs for clarification of their legal status. Of these, the judgement notes, "47 had so far been cleared". In a further 12 cases it said the director of public prosecutions for Northern Ireland "had said there remained a requirement to prosecute, and in a further 10 the police had sufficient evidence to warrant arrest for questioning." If any other outstanding offence or offences come to light, or if any request for extradition were to be received these would have to be dealt with in the usual way. We do not know details of the alleged offences this note referred to, but what it does make clear is that by that stage 22 of the 161 OTRs who sought legal clarification were not given assurances that they would not be prosecuted. In the same month, the judgement notes that a note was prepared by a senior legal official following requests from Sinn Féin for the administrative process dealing with OTRs to be speeded up. It was noted that "it would be necessary to include in the NIO's 'comfort letter' a qualification as to the level of comfort given." A suggested draft again stated that the assurance that an individual was not wanted for arrest, questioning or charge was given "on the basis of the information currently available." It added: "If any other outstanding offence or offences come to light, or if any request for extradition were to be received these would have to be dealt with in the usual way." Peter Hain, who was secretary of state when the process to deal with On the Runs was introduced, told the court that the key phraseology used in the personal letters was "in essence common to all, that on the basis of current information they were not wanted and would not be arrested." There is also clear evidence, other than the contents of the judgement, that not all On the Runs received assurances that they would not be prosecuted. The BBC has obtained a copy of a letter sent to the Northern Ireland Policing Board in April 2010 by Assistant Chief Constable Drew Harris, the PSNI officer with oversight of its role in the process, which was to establish whether named individuals were wanted for questioning or arrest. "Of the submitted names, 173 are not wanted, eight have been returned to prison and 11 remain wanted. In the year 2007 to 2008, three persons were arrested and referred to the court service. Of the remaining names, 10 have been referred to the PPS for direction, 11 are proceeding through Historical Enquiry Team review and two are ongoing live investigations." The letter sent to John Downey in July 2007 contained a caveat that his assurance could be reconsidered if new evidence came to light. His letter said: "The Secretary of State for Northern Ireland has been informed by the attorney general that on the basis of the information currently available, there is no outstanding direction for prosecution in Northern Ireland, there are no warrants in existence, nor are you wanted in Northern Ireland for arrest, questioning or charge by the police. "The Police Service of Northern Ireland are not aware of any interest in you from any other police force in the UK. If any other outstanding offence or offences come to light, or if any request for extradition were to be received, these would have to be dealt with in the usual way." The key phrase is once again "information currently available." The problem for the Northern Ireland Office was that at the time the letter was sent, John Downey was listed as wanted by the Metropolitan Police in connection with the Hyde Park bombing. The problem for the PSNI was that it was aware of this fact, but had not made the NIO nor attorney general aware of it when it carried out a review of John Downey's legal status. That meant Downey was wrongly informed that there were no warrants for his arrest, and enabled his lawyers to argue that there had been an abuse of process when he was arrested at Gatwick airport in May, 2013. It also meant the caveat about "any other outstanding offence or offences" coming to light was null and void, because at the time the letter was sent he was wanted in connection with the bombing. It was not an outstanding or new offence but one the authorities should have been aware of when the assurance was given because he was listed on the Police National Computer as wanted. Likewise, the fact that he was wanted by the Metropolitan Police was "information currently available" when the letter was issued. Legal sources say the problem was not a lack of caveat, but the fact that the PSNI did not highlight the fact that John Downey was wanted. The result was that when he was arrested, prosecution lawyers could not argue that it was based on new evidence, or information the state was not aware of at the time the assurance was given. Legal sources say that if the letters received by other OTRs contain similar wording, it would still be possible for them to be prosecuted at a later date if new evidence linking them to an offence comes to light. That is of course, unless other mistakes have been made and assurances have been issued based on inaccurate information. The PSNI is currently conducting a review of all OTR cases to determine if the information it gave the prosecution authorities was accurate.